Ginza is the epicenter of luxury in Tokyo. The streets are lined with high fashion labels, high-class eateries & ceramic wares that will blow your mind & your budget. Almost every store has its own bodyguard, whom opens & closes the door for every patron, with a slight bow. I have come to Ginza on few occasions, merely passing through to get to The Imperial Palace or Hibiya Park, however; on this particular day, I went into the heart of Ginza on a mission. To find Cafe De L'ambre. This particular cafe was brought to my attention by my workmate, Brandon, & the reason why was pretty clear. Cafe De L'ambre only sells black coffee. Yup, that's right, no soy flat whites here Sir. This is a shop for damn grown-ups! Upon entering the tiny store I looked to my right to see a full roasting set up in the front room. I was told that the late owner Sekiguchi Ichiro could be seen roasting the beans from the front shop window. Ichiro was 104 when he died. Despite his absence, the coffee house runs with meticulous efficiency. We were promptly seated & then given an English menu. The cafe was packed, but that wasn't hard a hard task as there were only about 16 seats. We were placed at a small round table in the corner but we quickly moved to the bar as two seats opened up. I wanted to see the coffee making process with my own eyes. The chairs we sat on were a deep red & the moved on a pivot. As we mulled over the menu, I saw men weighing the coffee on a roman scale & then hand grinding the beans. We made our choices of coffee & sat back & watched. We opted for one iced coffee liqueur type & one iced cold drip. An American couple across the way said that no.7 was the way to go. Alas, we had already ordered. On the underside of the menu was their more premium drinks. Some of the beans used in these were aged for over 40 years! Unfortunately being on a backpackers budget I couldn't splurge on a $20+ cup of coffee, however, if I come back to Tokyo on a more frugal budget I will. The filter for my cold drip was made to order. The beans were weighed, ground & then placed in a cloth filter. With a steady hand, the barista started to pour the newly heated water over the coffee, gyrating the filter over a metal skillet as he went. There were no timers, electric scales or grinders to be seen. In fact, the manner in which they cooled my filter could be seen as thrifty. 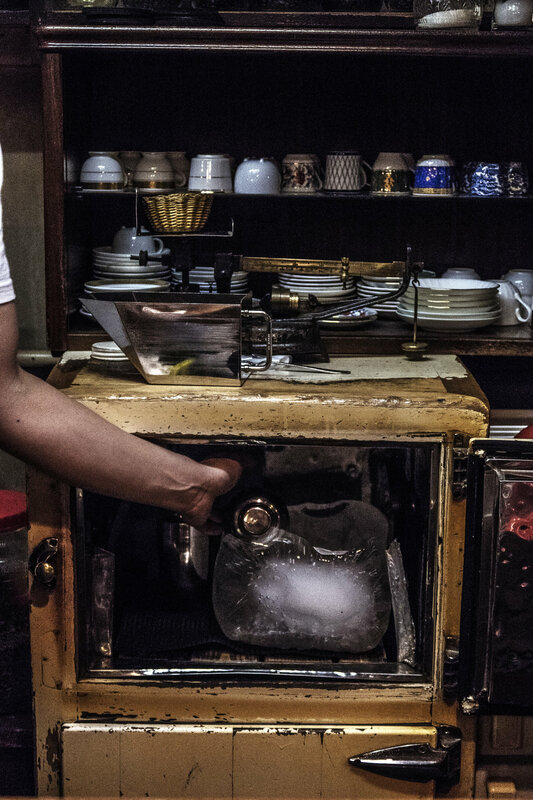 They opened a 1950's domestic fridge, with a huge ice cube inside. Putting my filter into a cocktail shaker, he then proceeded to cool it by rotating it into an already made groove in the ice. Within minutes my hot filter became icy. In accompaniment with my iced filter came, a tiny vessel of cream & sugar syrup; although, I did not need them. Despite the old methodologies, my filter was perfect. It took my breath away. It was so light & delicate. I sat & enjoyed my coffee as I watched the masters brew the other patrons cups. Some ordering filters like myself, others more exotic looking beverages. If you are passing through Ginza I would highly recommend going to Cafe De L'ambre. It is certainly one of a kind.